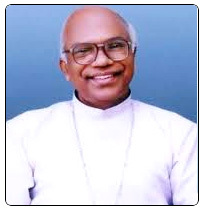 The Eparchy of Idukki was erected by His Holiness Pope John Paul II by separating the eight Protopresbyterates (districts) - Churuly, Erattayar, Koompanpara, Parathode, Rajakkad, Thankamany, Vazhathope, and Vellathooval ? of the Eparchy of Kothamangalam. The bull of erection, Maturescens Cathiolica Fides was promulgated on 19-12-2002 and the declaration was on 15-01-2003. Mar Mathew Anikuzhikattil was consecrated as its first bishop on 02-03-2003 and the Eparchy was inaugurated on the same day. The Eparchy is situated in the Eastern part of Kerala covering an area of about 3,000 sq.km. The Eparchy lies extended in Idukki district, surrounded by the Eparchy of Kothamangalam, Archdiocese of Madura and Eparchies of Irinjalakuda, Kanjirappally, and Pala. The eparchy has a total population of about 762040 of which 304800 are Catholics belonging to three individual Churches. The eparchy of Idukki, with its 150 parishes and mission stations having the strength of 261480 members, has a tremendous opportunity for evangelization.